Bingo Night In The Promised Land" brings together the works of British artists Miss Bugs, Los Angeles newcomer Hips And Hair, and Australian street sensation Reko Rennie. Miss Bugs is a collaboration founded in the early part of 2007; consisting of two people boy and girl Miss and Bugs. 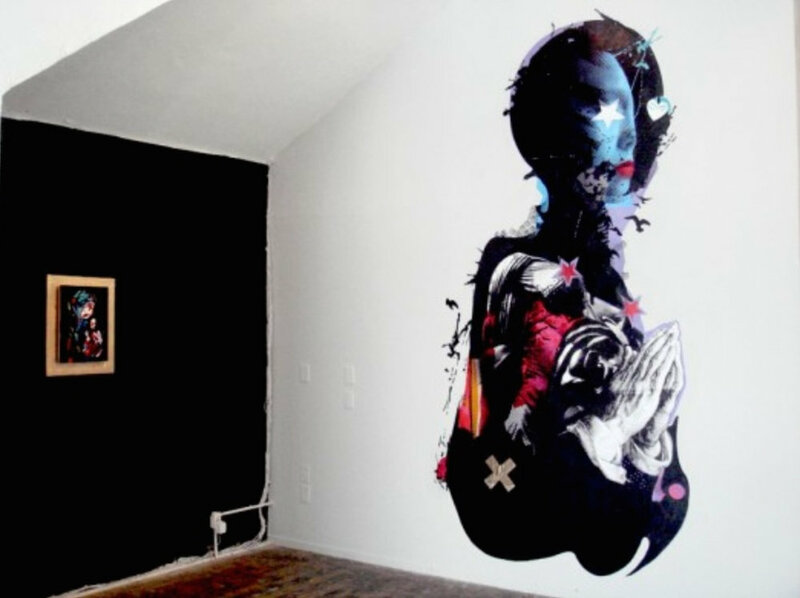 In this transitional body of work, Mis Bugs draws initial influence from the imagery of religious icons and paintings. 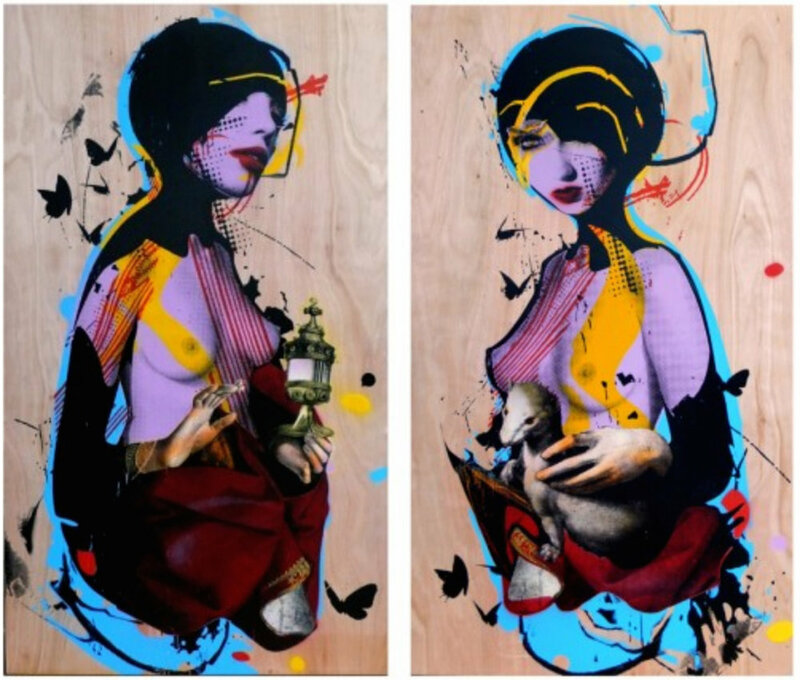 Playing within the limitations of the composition that is characteristic of religious images of the Virgin Mary, modern throwaway imagery is mixed up with the symbolic, to create powerful visions of the female form. The decorative element, black graphic line and flatness are intrinsic to the work. The figures are depicted with veiled or partly masked faces and the eye is drawn to the delicate hands. The slight distortion of scale gives the figures an otherworldly feel and warps the modern idea of conventional beauty. 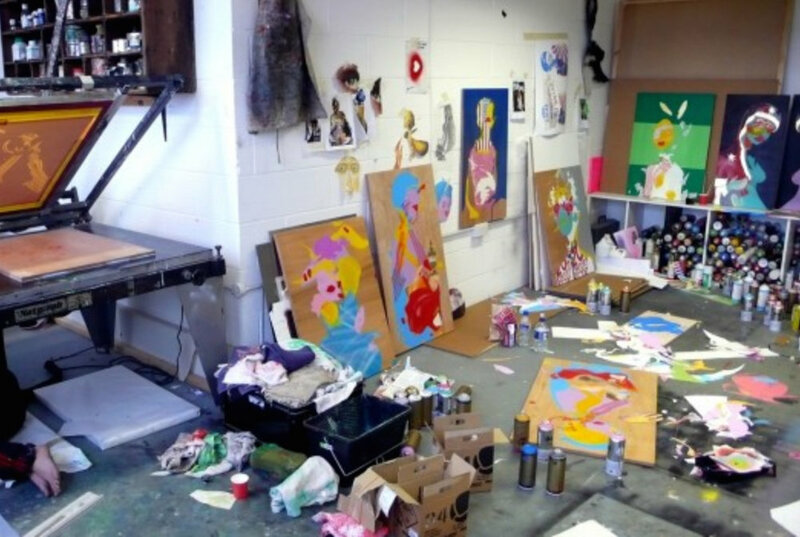 New on the scene is Los Angeles based artist, Jonathan Bussiere, also known as Hips and Hair. 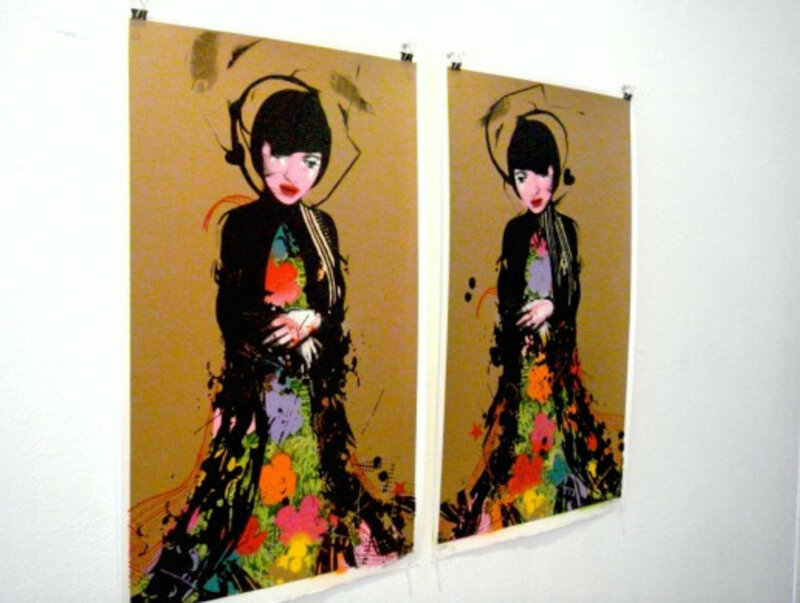 Hips and Hair's work combines stencil with images of pin-up girls in newspaper collages, dripping with bloody paint splatter. His work can be described as a morphing of modernist cubism while lending itself to a 80's palette with New Wave fee. Reko Rennie is a Kamilaroi/Gamilaraay/Gummaroi man, who was born in Melbourne, Australia in 1974. Through his art, Rennie explores the traditional symbology of indigenous flora and fauna. Rennie's artwork goes beyond the frame and reflects his love and history of working directly onto walls. His work is patterned with repetitions of native flora symbols that renders a language of wallpapered interiors. This contrasts with Rennie's beginnings as a street artist in Melbourne. Rennie utilizes the indigenous language of geometric motifs that are specific to the Kamilaroi/Gamilaraay/Gummaroi people. Thes associations are key to Rennie's focus on what it means to be an urban aboriginal man in contemporary society.